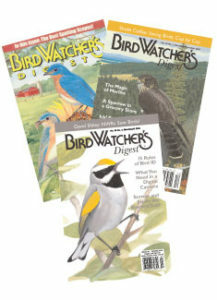 Subscribe to BWD today and you’ll receive a useful and interesting birding magazine written by birders and for birders. But even better, you will also support Northern Virginia Bird Club. For every NEW paid BWD subscription sold through this special promotion, Northern Virginia Bird Club receives $10 from BWD!